In order to ensure that all master´s theses and doctoral dissertations produced at Georgia State University are captured, preserved, and appropriately made available, the University requires all students who produce a master´s thesis or doctoral dissertation in fulfillment of his/her degree to upload the final version of these documents to ScholarWorks@Georgia State University as a condition of the award of the degree. Programs requiring extra time to submit master´s theses or doctoral dissertations will have no more than five years to meet the submission requirement. 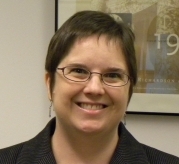 Have you included any copyrighted material in your thesis or dissertation? If yes, have you obtained permission to include that copyrighted material in your thesis or dissertation? If you included copyrighted material and have not obtained permission, then you must obtain these permissions before you can continue with the submission process. Contact the Office of Legal Affairs if you have any questions. Does your thesis or dissertation disclose or describe any inventions or discoveries that could potentially have commercial application and therefore warrant patenting? (If you and/or your faculty advisor(s) have any questions about making this determination, please contact the Office of Technology Commercialization & Industry Relations). If yes, the technology transfer and patenting process necessitates further conversation before you can continue with the ETD submission process, in order to determine the appropriate embargo on access to your dissertation to protect patent eligibility. Are you requesting an access restriction for your thesis or dissertation? Colleges at Georgia State have different policies regarding embargos, and many require permission for an embargo, so be sure to check with your college before making this decision. By choosing no embargo you are agreeing to publish your thesis or dissertation in ScholarWorks@GSU immediately after graduation. This option will provide the broadest possible access to your work. The full-text of your thesis or dissertation and any supplemental files will be accessible on the internet for unlimited viewing. Your thesis or dissertation will be indexed and discoverable via major search engines. By choosing an embargo, you are requesting that there be no access to the full-text of your Dissertation for a specified period of time. Your dissertation will be listed and indexed in the Georgia State University Library Catalog and in ScholarWorks@GSU, but the full text of your Dissertation, and any supplementary files, will not be accessible until the expiration of the embargo. The title, author, keywords, and abstract will be displayed on the web in the record for your Dissertation even if you have restricted access to the full-text copy. If you are embargoing due to patentability concerns, make sure your abstract is written so as to not be considered prior art. If do not want an abstract displayed at all, enter “No abstract to protect patentability” in the abstract field when you upload your thesis or dissertation. By choosing a Closed Thesis or Closed Dissertation you limit online access to the full-text of your submission to the Georgia State University campus (IP address). No one outside of GSU will be able to see your thesis or dissertation. This is the equivalent of the access that was available when theses and dissertations were only on a library shelf. Your thesis or dissertation will be shared as the result of an Interlibrary Loan request. Submitting in 8 Easy Steps! This page shows you what you will see when you submit your thesis or dissertation. 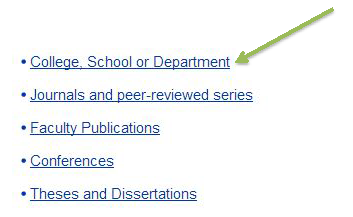 For a text version click on the arrow next to the Submitting ETDs to ScholarWorks tab above. Make sure you have all of the information you will need before you begin submission. Find your way to ScholarWorks @ Georgia State University. Click on the "College, School or Department" link. 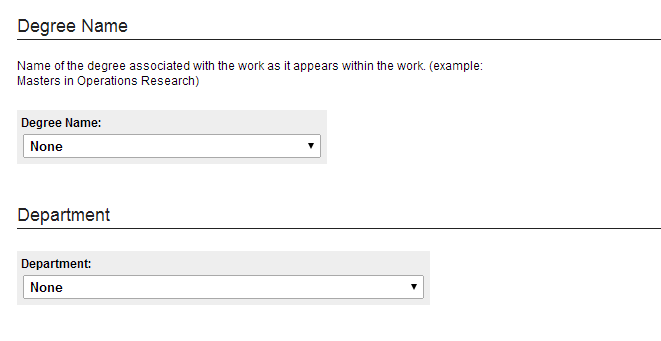 Scroll through the list to find your department, then click on the Thesis or Dissertation link under that department. Example: I'm submitting my Counseling and Psychological Services Dissertation, so I would scroll to College of Education > Department of Counseling and Psychological Services > Counseling and Psychological Services Dissertations. Note: If you do not see a link for Theses or Dissertations in your department, contact scholarworks@gsu.edu. On the bottom of the right side menu, under "Authors," click "Submit ETD (Thesis/Dissertation)." Log in using your CAMPUSID and password. Or, if you'd like, you can create a new account with a different user ID and password. Then move on to Step 6. You'll see a "Submission Instructions/Submission Agreement" page. Be sure to read it all. Take particular note of the "Submission Agreement" section. You may want to print a copy to keep for your records since it outlines the rights you retain and the rights you grant to Georgia State University. You can see a copy of the agreement by clicking here. Check the box at the bottom of the page and click continue. Dissertation/Thesis Title - DO NOT USE ALL CAPS, even if you are instructed to use all caps in the document itself! Please enter the title in headline style - meaning capitalize the first letter of the first word and the first letter of each following word in the title EXCEPT prepositions, conjunctions, articles, and the second word in hyphenated words. Author - This is pre-populated with the information you entered when you created your account. Make sure it is in MLA style - meaning capitalize the first letter of each name/word. Do not use all Capital Letters. For example, John Q. Doe. If you would like to continue to receive monthly download counts for your thesis or dissertation after you graduate, you should enter a persistent, non-GSU email in the Author Email field. If you need to edit your author information, click the button. Date of Award - Please use your Commencement (Graduation) date (NOT a defense or submission date) and do NOT add a season. Embargo Period - Please discuss your embargo decision with your college and your advisor.Different colleges have different policies. Access Confirmation - confirm that you made the intended Embargo selection in the previous step. Degree Type / Degree Name / Department - Please make the appropriate selections from the drop-down menus. Advisors- The First Advisor is the Chair of your committee. List the other committee members as second - seventh advisors as applicable. Abstract - Type or paste your abstract here. Keywords - Add appropriate keywords or phrases separated by commas. Do NOT use all CAPS. You will see a "Choose File" button appear. Navigate to your file and click "Open"
The system attaches your file. Note: If you are submitting a thesis or dissertation with a linked Table of Contents, convert the file to pdf format and check the TOC links before uploading the file from your computer. This will help eliminate any problems associated with automatic file conversion. If the "Save as PDF" function in Word does not create a PDF with active Table of Contents links, try using Adobe Acrobat to convert the file. Additional Files - this will not apply to most of you, but if your thesis/dissertation has related files you need to upload (and you have the rights to upload them) you must check this box in order to attach them. Double Check all your entries and click "Submit." You will get a confirmation screen that shows what you have submitted and gives you the opportunity to revise if necessary by clicking the "Revise Submission Button." You will also get an email confirmation of submission. You can click on "My Account" to see the status of your Thesis/Dissertation (you may log in at any time to see this). You can also "Log Out" on the "My Account" page. You will get an email from the system when the administrator has approved your thesis or dissertation and it has been published in ScholarWorks @ Georgia State University. Note: If you need to make revisions to your thesis or dissertation, please do so by using the "Revise Submission" option. Log in, re-upload the revised version of your thesis or dissertation and it will replace the previous version. Please do not submit multiple copies of your thesis or dissertation. Once it's been approved and published you can see it by browsing to the same collection you submitted it to or by clicking on the "Theses and Dissertations" link from the ScholarWorks @ Georgia State University's homepage. A full screen shot of the submission / metadata entry page as a PDF file. Kenneth Crews, J.D., Ph.D. and Director, Copyright Advisory Office at Columbia University has written an insightful article which examines copyright and your thesis or dissertation.